Is Altcoin Trends a Scam? Honest Review Exposes It! However I think you’ll agree that that’s a pretty bold claim – I mean essentially they’re stating that you can simply sign up & start making between $1,350 to $3,700 per day without actually having to do anything… So what’s the deal here, is it actually legit or is Altcoin Trends a scam that’s just to set to part you with your cash? 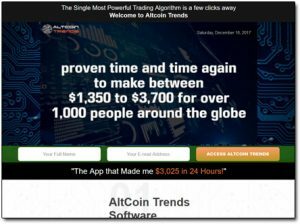 Altcoin Trends poses as a legitimate cryptocurrency trading program but unlike the other ones I’ve come across (which all turned out to be scams) this one claims to be geared towards trading altcoins (rather than Bitcoin). I’ll agree with them on this part because I do believe there are profits to be made by trading altcoins – the other benefit of trading altcoins is generally the initial price is much lower (as at the time of writing this review Bitcoin has become very expensive). However let me tell you that you will NOT make any money as a result of trading through the Altcoin Trends program. The reason I say that so confidently is because despite initially seeming to be different to the other cryptocurrency trading scams I’ve exposed on this blog, this program is actually no different at all. How Does Altcoin Trends Work? Well the first thing I will make clear is the fact that the Altcoin Trends program doesn’t actually work, at least not as they promise it does anyway. This program has been purely developed to part you with your cash, making the creators (and the affiliates promoting it) wealthy at your expense. You see the truth is that this is actually just another binary options scam. A couple of years ago this type of scam was huge however it died down because people became wiser to it so they weren’t as effective. Unfortunately as of recent this scam has started to resurface as they are now using all the hype surrounding cryptocurrency to once again trick people into signing up & depositing funds. Yesterday alone I exposed 2 new scams, Cryptorobo & the Crypto Genius system & I expect there is likely a lot more to come. 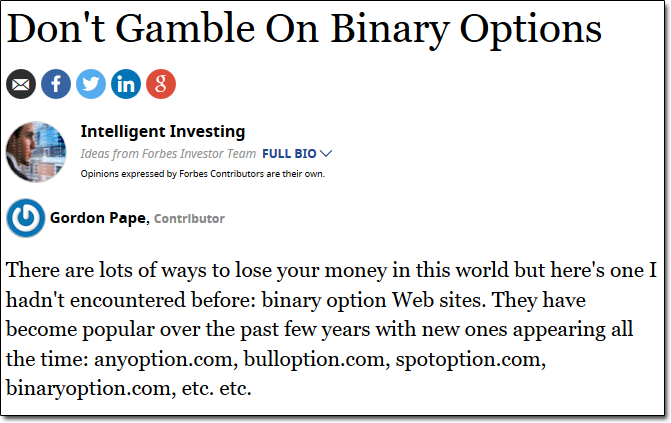 Anyway the first thing you need to know is that anything to do with binary options trading is bad news – it is a total scam & it is an industry full of rogue broker & rogue software. The problem with it is so bad that the USA along with several other countries even banned these types of things from operating within their borders. Forbes themselves also published an article warning people about the dangers (as shown below) & that’s not the only site to have done so. Basically binary options trading is a BIG problem. The biggest issue with it is the fact that it makes you seem like you are in control, when in reality it is just a gamble. 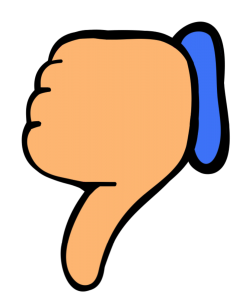 The worst part is because of the way it’s set up it means that in reality the chances of generating a profitable trade are WORSE than being able to guess the outcome of a flip of a coin. OK so how does all this fit in with the Altcoin Trends software? Well basically many people became aware of the dangers regarding binary options trading. Due to media warnings etc they learned that if a program is promising you can make easy money through automated trading then it is likely a scam. However now many people have become very hyped up about the potential opportunity of making money through cryptocurrency & they are scared that they will miss out so they are eager to get involved… This may be how you feel right now. Anyway basically these same binary options scammers from before have noticed this trend & they have altered their approach. They are now creating the same binary options scams as before but making out as if they are cryptocurrency trading platforms to make them seem believable. I’ve seen many of them launch & I’ve exposed several of them here on this blog – one of the biggest ones to date was The Bitcoin Code but there are many more just like this one launching all the time. People have seen what happened with the price of Bitcoin so they assume that hey, maybe an income of $3,700 per day is actually possible. I can tell you that it is not, certainly not through the Altcoin Trends system & overall it is unrealistic to think that you will be able to generate that kind of level of profit from any trading unless you are an absolute expert. I am talking within the top 1% (or even less) of investors. Can you make that kind of money anywhere online? The answer is yes you can, but in my opinion investing is not the best way to go about it because it involves too much risk. Something like Wealthy Affiliate, a program where you are in full control of your income is much better – but of course to get to that kind of money you must expect to put in some degree of work. The internet provides you with a lot of fantastic opportunities to make money however none of them are going to generate you lot’s of cash without you having to do anything – if they could then everybody would be using them, nobody would be working a job. Is Altcoin Trends a Scam? The answer to that is 100% yes & I will tell you exactly how it works. The shocking fact that you need to realize here is that the Altcoin Trends system has actually been created by a broker – that’s why you are forced to make a deposit with the programs “recommend broker” before you can gain access to it. Remember what I said above when I said that the binary options industry is full of rogues? Well yes many of the brokers are rogues too & they will do anything to part you with your cash. Sadly they are often very convincing. Now here’s an important thing you need to realize. Binary options brokers only make money when people lose because they do not add fees to their trades, they just keep the cash that you lose (like how a bookmaker works). So ask yourself, why would they create (or associate themselves with) a system that can supposedly generate you automated profits? The answer is they wouldn’t, because this would put them out of business. This means that the Altcoin Trends system clearly doesn’t work as promised. Instead it’s just a ploy to make you think that you’ll be able to profit to encourage you to deposit so that the brokers can get you money. Once they’ve got your money that’s the last you will see of it. Even if you don’t trade with it all you still won’t be able to withdraw any of it because as I say these guys are just total rogues & they are best avoided… So if you can think you can “try it” risk free then think again because that’s just exactly what they want you to think. After depositing your money you will simply find out that the system doesn’t actually work as promised & instead of making money your trades will all just be complete losses but by this point it’s too late because the broker has already got your money. It’s likely that they will even try & convince you to deposit more, claiming that there was some sort of glitch in the system the first time you tried. Ultimately this is just a flat-out scam that’s been designed to part you with your cash. As always on this blog I like to be completely honest & open with my readers so I will tell you that yes, you would be right in thinking that I haven’t actually tried this software but don’t let that fool you. As I always say “you don’t have to be scammed to know a scam”… I have been working in this industry for several years & it is very easy for me to spot a scam like this one, they share all the same tell-tale signs. The truth is that there is simply no system or program that will ever generate you money like this on complete autopilot… It’s just not possible. I make money online myself but it requires work on my part, if there was a system that could actually do what Altcoin Trends promises then I would be using it myself rather than working LOL. Sadly there is not. However if you want to make money online yourself then you can definitely do so – you could just do exactly the same as me, I learned my skills through Wealthy Affiliate (a free program) & there is nothing stopping you from doing the same. Hopefully you appreciated the review & of course I hope it also prevented you from losing money to this so-called software. If you do happen to have any further questions feel free to leave them below in the comment section. Trend Catcher Review – Scam or Legit System? Will BitClub Network Really See You Cashing In On Bitcoin Or Is Yet Another Investment Scam?